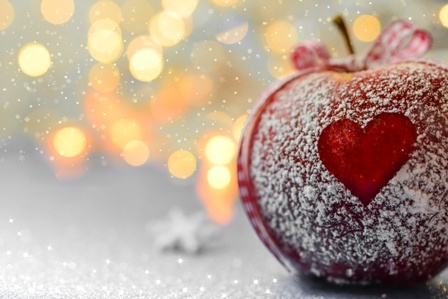 Apple Garland was a candle I took a deep inhale of the moment I smelled it and just smiled. I literally just smiled. It smelled SO good!! I don’t know if Bath & Body Works is listing this one as a fall or winter scent but honestly, it smelled wintery to me. I detected fresh apple, mint and pine or something close to it. Made with eucalyptus and cedarwood essential oils with notes of gala apples and mistletoe. I was close!! I could smell a bit of everything listed – sweet apple, eucalyptus, (the mint) and mistletoe which I initially thought was pine. The cedarwood I wasn’t so sure about but if that comes to life, I’ll be ecstatic. Love me some cedarwood! I lit this candle in my master bedroom and waited for the Apple Garland magic to begin. It didn’t take long, 10 minutes max and oh my goodness! Love! My entire bedroom smelled like fresh apples and mistletoe with woodsy hints of cedarwood. It smelled SO FREAKING GOOD!!!! I’m going to say Apple Garland is more of a holiday scent than fall because it smells like Christmas to me and I couldn’t get enough of it. The eucalyptus surprisingly toned down once the candle was burning and I was okay with that… to me, this candle smelled like a perfect and woodsy apple scent but fresh and uplifting with the mistletoe. I highly recommend this one. Highly! 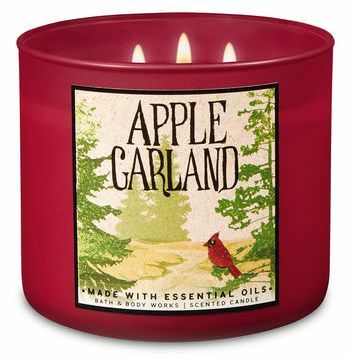 Apple Garland is a must have if you’re after a fresh holiday apple scent. I’m just so impressed with this one, I’m going back for a few more before they’re gone. I hope Bath & Body Works keeps this one around for a long, long while. I’m that in love.